The two photos were taken about 10 days apart. A small vigorous tree with wide horizontal branching, that can develop a layered effect. The reddish pink bracts have a white eye. Many consider this one of the darkest pink-red selections. The fall color is deep red to burgundy. 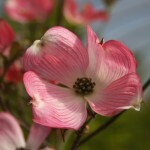 It is resistant to mildew and more drought tolerant than other Dogwoods. 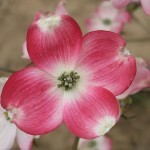 It prefers moist, well-drained soil in full sun or part shade. Introduced to the trade in the mid 1990's by Commercial Nursery. PP 10,166.